Remember "Mobilegeddon?" Back in April of 2015, Google announced that mobile-friendly sites would be given priority in search results. They stated that if all other factors were equal, a site that was mobile-friendly would rank higher than a site that was not mobile-friendly. Fast forward to October of 2016, and Google is taking their prioritization of mobile-friendly sites another step forward. 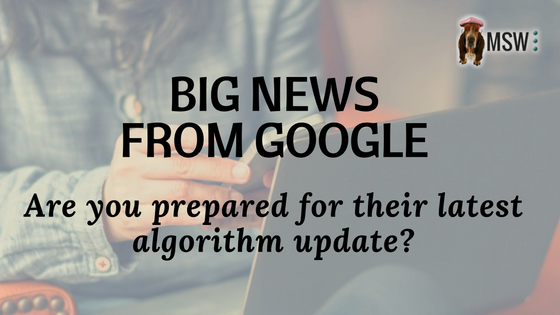 Keep reading to learn more about the newest algorithm update and how it may impact your website's search engine rankings from our internet marketing experts. Before the use of smartphones became so widespread, almost every single online search was performed on a desktop (or laptop) computer. As smartphones became more popular, this balance began to shift. According to SearchEngineLand, approximately 60% all of today's searches are performed on a mobile device. (That number is significantly higher for certain industries, including food and beverage, health, and sports). Experts predict that as we move forward, the balance will continue to shift. At some point, we expect that mobile searches will completely overpower desktop searches. Google's algorithm is influenced by approximately 200 different factors. At MSW Interactive Designs LLC, our job is to help our clients' sites rank well by ensuring they are properly optimized to meet the criteria set by these 200 factors. As such, we want to be sure to inform our clients of Google's newest algorithm update. Last month, Google announced that its search indexes will now be split into two versions: a mobile version and a desktop version. The mobile version will be updated constantly in order to ensure that mobile users access the most relevant results. The desktop version will not be updated as frequently. Mobile-Friendliness - If Google does not consider your site to be "mobile-friendly," it will likely not rank as well. You can use Google's mobile-friendly test to determine if your site is mobile-friendly by Google's standards. Load Time - According to Google, over half (53%) of users will only wait 3 seconds for a site to load before abandoning it and moving on to the next search result. Content - The new algorithm update specifically targets websites whose mobile versions are overly "stripped down." Prior to this new indexing split, Google used the desktop version of a site to determine where it should rank. After the introduction of this new algorithm, Google will specifically crawl the mobile version to determine where a site should rank in mobile searches. The bottom line is that in order to rank well organically in the new algorithm, your site must be mobile-friendly, it must load rapidly, and it must have plenty of high-quality content that Google can use to determine where your site should rank. If you have dealt with search engine optimization before, you know that it can be challenging to build a site so that it effectively meets all of the criteria needed to rank well. Our website design company is here to help you build a professional website that should rank well in both mobile and desktop search indexes. For more information about our website design rates and our search engine optimization services, visit us at www.MSWInteractiveDesigns.com. You can also give us a call at (573) 552-8403, and we will put the web to work for you.